The ball bearing might be Leonardo Da Vinci’s less celebrated invention, but it’s importance is undeniable. Originally a part of his failed helicopter invention ball bearings of a similar design to Leonardo’s are in just about every moving machine today. Ball bearing design is simple: to reduce rotating friction between two pieces, the bearing has an inner and an outer race. A number of balls roll in between the two races, allowing the minimal contact points between the inner and outer races. The balls allow the two pieces to roll a lot easier than the two pieces would slide against each other without the balls. To reduce friction the balls are kept separated and are evenly spaced throughout the races to spread the load evenly.Most bearings use cages to separate and evenly space the balls as needed. But cages cause friction and to reduce this friction, bearings are generally lubricated, often with a thick grease to ensure a long lifespan. A new bearing design created by Japanese manufacturer Coo Space has come up with a way to reliably space the balls out without needing a cage. Coo Space’s Autonomous Decentralised Bearing (ADB) puts a small indentation, or groove, into the outer bearing race. As the balls slide over this tiny groove, they slow down ever so slightly, and then speed back up. 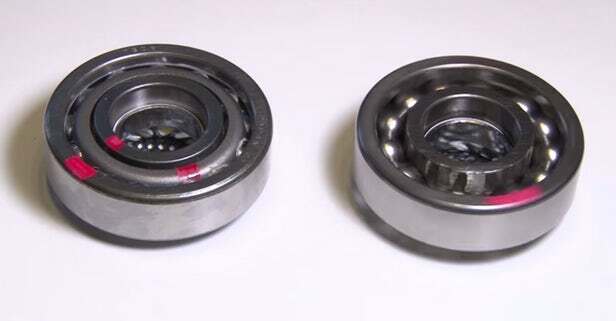 This does nothing to affect the bearing’s regular performance, but if two balls are touching each other as they cross over the groove, the first ball’s deceleration puts a tiny brake on the second ball, which separates the two as they go around the races. It’s an incredibly simple and tiny change, but it does a remarkable job. In the video below, a bearing is rotated with a group of very unevenly spaced balls in it. Within a dozen or two turns, the groove has spaced them all out to just about even, and that’s where they stay. Without the need for a cage, you can run these type of bearings without lubrication, which provides a real performance benefit. Coo Space claims the ADB experiences as little as 10 percent of the friction of a regular ball bearing and demonstrates this by spinning a couple of bearings to show just how much longer they’ll spin than a lubricated cage bearing. Hint: lots longer, which should come as no surprise to anyone who’s played with a regular lubricated bearing.